What is the BEARSHARE Brand Portal? 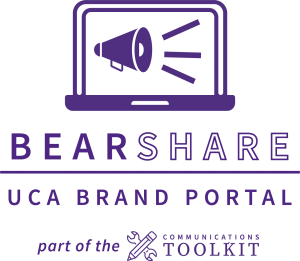 The BEARSHARE Brand Portal is a way for university employees to access branding and marketing materials. Photographs, logos, graphics, promotional materials, social media graphics, electronic stationery, guidelines, editable templates and much more can be accessed through the portal. Anyone! All UCA employee can access the portal. Employees should have access to all the brand assets in their department. If they would like access to another area’s assets, or have trouble logging in, contact University Marketing and Communications. New employees are entered manually, so contact UMAC if you do not have access yet. Employees can access the portal through myUCA. Simply log in to myUCA, find the BEARSHARE Portal icon and use your myUCA username and password to log in to the portal system. Once in the system, you can browse, download or share any of our marketing and communication assets. You can log in 24/7 from on or off campus. Download the BEARSHARE log in instructions. Do I need training before I access the portal? You don’t necessarily need training to use many parts of the portal. The system uses a simple navigation, a folder system to house assets and a pretty simple download system much like that of many online retailers. However, to use some of the advanced features and get the most out of our template editor, we suggest downloading our training manual, viewing training videos or attending one of our training sessions. The BEARSHARE Brand Portal is a function of University Marketing and Communications. We would love to hear your feedback and suggestions! If you have questions or suggestions, please contact UMAC at branding@uca.edu or 501.852.2620.